The wrist and the hand are made up of bones, tendons, muscles, nerves, veins, ligaments and connective tissues, all fundamentally used in daily activities, which increases the potential for injuries. Since any direct trauma or laceration of the hand can have unpleasant consequences, including a handicap, you must quickly consult to obtain an accurate diagnosis. The menu above will allow you to explore the treatments offered at the Clinique Chirurgicale de Laval to treat various wrist and hand problems. The fingers and the hand are articulations in delicate balance stabilized by congruent bones, ligaments and tendons that act as stays to move the fingers in any direction. When there is imbalance, we observe predictable deformity in the fingers and wrist. Any type of injury whether articular, of the ligaments or tendons, due to trauma, arthrosis or arthritis may cause a deformation. Osteoarthritis at the base of the thumb (CMC arthrosis) induces a progressive deformation called swan neck of the thumb, which prevents the thumb from opening. If the deformation prevents the hand from functioning normally, we must seek the professional opinion of an occupational therapist. The use of a moulded orthosis to support the articulation may help prevent further deformation. Failing that, a surgical correction can be recommended using acarpo-metacarpal arthroplasty of the thumb. Rheumatoid arthritis is one of the systemic diseases which also affects the hands and produces typical finger deformities like ulnar drift. A multidisciplinary approach is important and must include a rheumatologist, a hand surgeon and an occupational therapist to control inflammation and prevent deformities(using orthoses or adaptations). Surgeries such as articular cleaning (synvectomy), articular realignment (tendon transfert) or joint replacement (articular replacement arthroplasty) are available to treat this condition. The thickening of a layer of fascia under the skin due to genetic predispositions produces nodules in the palm and contracture of the fingers. Dupuytren diseases is benign but slowly progressive. The flexion most often of the fourth and fifth digit induces a loss of function and impairs daily activities. The classic therapeutic approach is to remove or break the fascia cords in the palm of the hand. This treatment called fasciectomy or fasciotomy is a significant surgery which requires a rather long process of rehabilitation. Since 2013, a new treatment involving biological enzymes can dissolve these cords and restore finger mobility without surgery. The injection of collagenase (Xiaflex) to treat Dupuytrens disease is an effective treatment when performed by experienced specialists. Finger sensitivity is an essential function of the hand. This sensitivity is ensured by primarily two nerves (median and ulnar). Nerve compression induces an ischemia and slower rate of blood perfusion which in turn causes a tingling feeling in the fingers. When the middle finger, the index and the thumb are numb, one can suspect the median nerve is affected along with a carpal tunnel syndrome. If the loss of feeling is located in the ring and auricular fingers, the ulnar nerve is affected and most often the elbow with ulnar tunnel syndrome. We must first reduce compression by placing the member in a resting position that kinks less the nerve. The compression of the wrist is reduced by keeping the wrist in a neutral position wearing a resting splint especially at night. Extreme bending of the wrist and elbow must be avoided. One must also ensure there are no other conditions precipitating the change in the nerve like thyroid disease, diabetes, arthritis or other nerve compression problems elsewhere, like in the neck for example. Once the root of the problem is determined by electromyogram, the definitive treatment can be a carpal tunnel decompression or a ulnar nerve transposition. One must find the pains source to provide appropriate treatment. The clinical exam here is of the utmost importance and locating of the pain is the best way to find its source. 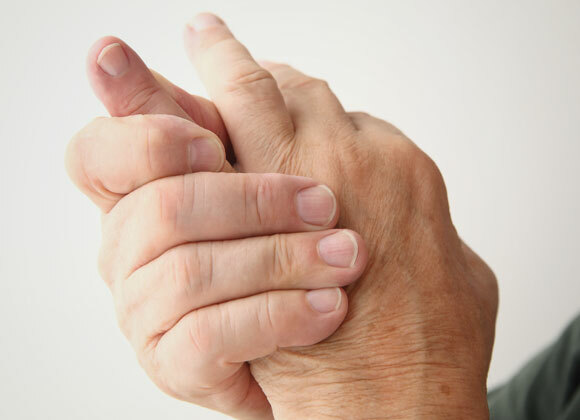 One must evaluate each tendon, each joint and even each small bone of the hand and wrist to probe and tension the exact site of the pain causing a functional incapacity. If the problem is articular, further examination is often necessary using x-rays or a more sophisticated form of imagery like a scan or a magnetic resonance. A bone can become ununited (scaphoid pseudoarthrosis is frequent in active subjects). 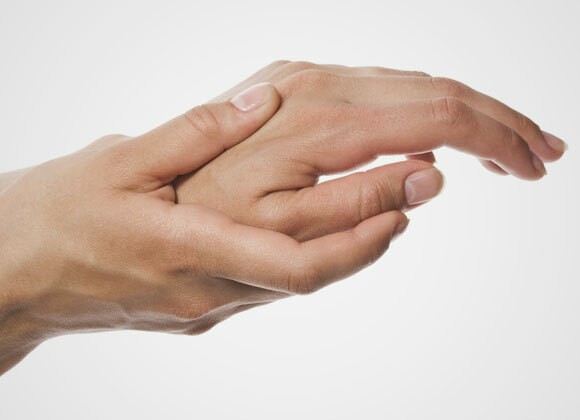 Premature wear can also be a source of pain as in (trapezio-metacarpal arthrosis) or wrist arthrosis. Depending on the type of trauma, pain can also stem from a ligament lesion or sprain with a possible ligament rupture. The scapholunate ligament and the carpal triangular ligament are likely to be harmed. X-rays and further examination will confirm the diagnosis. It may be necessary to gain more insight in the problem using wrist arthroscopy. After the failure of conservative treatment, depending on the severity of the lesions, one can consider a synovectomy (a cleaning of the articular membrane), a bone graft to help bone healing, an osteotomy (changing the bones shape), a partial arthrodesis (an internal fusion) or an arthroplasty (joint replacement). Tendons encased in a synovial sheath are subject to mechanical friction that can cause inflammation. Stenosing tenosynovitis or trigger finger and DeQuervain tendinitis are its most frequent manifestations. After a period of task modification, of immobilisation with an orthesis, steroid infiltration, surgical decompression of the affected tendon is indicated. Most of the time, a bump on the wrist or the hand is benign. According to location and consistency, we can precisely determine its nature and if there is no rapid growth or functional discomfort, the swelling in the region of the hand can be observed without treatment. If a synovial cyst or a benign tumor is painful and troublesome, a surgical evaluation becomes necessary to avoid progression or relapse. The removal of a bump can be done under local anasthesia. It is the best way to determine the nature of the mass.